This documentary provides an inside look into the events leading up to the 1988 Piper Alpha oil rig explosion, an event that claimed 167 lives. This documentary features a brief history of London's Crystal Palace (which burned down in 1996 after an accidental fire), as well as the 1988 explosion aboard the Piper Alpha, an offshore drilling platform in the North Sea. 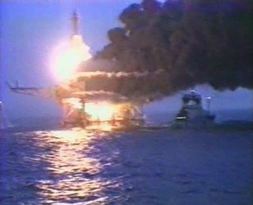 A video uploaded on youtube on July 1, 2010, showing primary footage of the Piper Alpha explosion. Report on the oil market in New York and London. A rescue diver answers questions about the Piper Alpha rig explosion and what they did to save the people on the rig. Mark Webster reports on the case for the compensation needed for the victims of the Piper Alpha rig explosion. Located 120 miles off the Scottish coast, the Piper Alpha oil rig experienced one of the world's deadliest explosions on July 6, 1988. The disaster claimed the lives of 167 people.